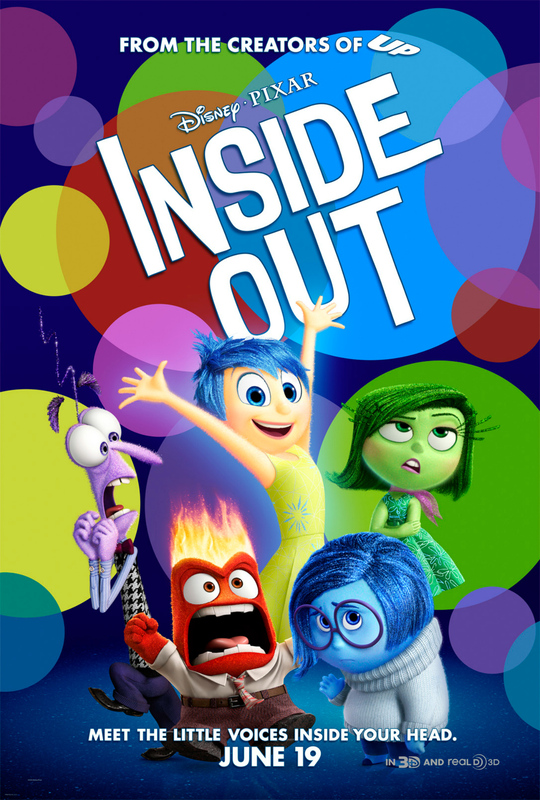 Inside Out focuses on the internal emotional workings of a young girl named Riley [Dias]. Her head is dominated by living embodiments of Paul Ekman’s six core emotions (although for the film ‘surprise’ has been dropped): Joy [Poehler], Sadness [Smith], Fear [Hader], Anger [Black] and Disgust [Kaling]. These emotions experience the world through Riley’s eyes and do their best to take control of a situation, reacting how they see fit. It’s a very simple analogy for how our feelings control our actions and reactions but it’s very effective. Riley is a very happy, content and sheltered only-child with strong friendships, a love of hockey and clear bonds with her mother and father. All of this changes when their family move from Minnesota to San Francisco and Riley has problems adapting. Incidentally, that’s the whole story: ‘a young girl has a bad day at school and decides to run away from home.’ But internally there’s so much that needs to be processed – which is true of all characters and stories throughout cinema, we’re just not used to being exposed to every incremental stage of the thought process. All of Riley’s memories up until this point have been categorised as predominantly fearful, sad, happy, angry or disgusted. But as she gets older, Riley’s once happy memories are tainted by sadness and in trying to keep everything in working order, Joy and Sadness are sucked from the control centre and deposited in the young girl’s endless labyrinth of long-term memories, jump-starting the odyssey element of the story. I don’t know if Walt Disney set out to produce films about princesses, I think he was just producing animated versions of classic European fairy tales (which happen to feature princesses) but either way, Disney will forever be associated with dictating how we see princess characters. Pixar is no different. There are a few renegade films but by-and-large they focus on the world unseen; the fantastical day-to-day mechanics of things we take for granted. And what’s more they’re extremely good at it. That is up until 2011 when Pixar started flailing, punching out Cars 2, Brave and Monsters University, all of which were rather lacklustre and disappointing. And while Inside Out isn’t exactly an original property (things like Herman’s Head have been reincarnated for decades) it’s treated as such and brings something thoughtful, inspirational and touching back to the cinemas. So is Pixar’s future back on track? With the upcoming releases of the overly cutesy looking The Good Dinosaur and the completely unnecessary Finding Dory, I’m not entirely confident. But regardless of that, Pete Docter has three directorial credits to date which are Monsters Inc, Up and Inside Out; arguably three of the finest Pixar releases. In truth, Inside Out is a very refreshing and heartfelt release that, like Up has no qualms about dealing with uncomfortable situations and frankly upsetting the audience. As with most western animated features, everything is very on-the-nose and obvious, leaving little to nuance and ensuring the key messages aren’t misinterpreted (but they will be, they always are). But it’s so expertly executed that we can almost forgive that and knowingly wade hip-deep into the sentimental mire laid before us. I genuinely worry that we take Pixar’s beautiful animation for granted. There are many studios pumping out stellar animated releases but Pixar haven’t really put a foot wrong visually – yes I’m including the Cars films in that statement. The external world which Riley inhabits is very decently designed and simplistically presented, melding realism with a cartoon stylising. The characters and locations in Riley’s head are equally simplistically presented: a central control tower with a single panel, producing orbs containing memories, which are then catalogued and processed at the end of each day. The various sections of the psyche are portrayed inventively but straightforward enough to be easily interpreted. Michael Giacchino continues his run of subtle and moving Pixar scores, offering clear themes that thrill and resonate throughout. But the key to this film’s success is the amazing cast. Each of the voices fit their role greatly and whereas these caricatures would usually be seen as two dimensional and blunt, their depth and range is apparent thanks to the acting talent breathing life into these beings – that and they represent one specific emotion, so they are intentionally somewhat two dimensional. Another bonus is that this film is led by three strong female individuals without ever feeling like a forced or blatantly marketed decision. One could argue that this isn’t appropriate subject matter for a family film, that the complexities of a person’s inner workings is too despondent for a children’s adventure movie. I say ‘one could argue’ because this seems to be at the head of the majority of negative feedback about this film: too depressing and too complicated. I hate these kinds of reviews. Those that say what is or isn’t appropriate for a kid’s release. Not every child is the same and I personally feel that the fact that almost 90% of kid’s films rely on fart jokes is more inappropriate than a film being challenging or maudlin. The other key point of contention I wish to address is that people experiencing only one clear emotion at a time is inaccurate. And while that’s a fairly valid point, I think the film clearly addressed this when explaining the effects of the aging process, which complicates matters and creates a melding of emotions; essentially introducing children to the concept of the bittersweet sensation that they couldn’t process at a younger age. Through the anthropomorphisation of these emotions, Inside Out explains some very abstract and difficult subjects in a way that children (and let’s face it, a lot of adults) can understand. And most crucially, the moral as the film progresses is not the value placed on one over the other but the complex harmony and blending of all these sensations. As such, with a strong moral message, exceptional visuals, memorable characters and great voice acting, Inside Out is a wonderful family release that feels a cut above the standard fare. More of an observation than a specific scene and one I noticed from the very first trailer. The emotions in other people’s heads are all one gender and manifest various physical traits of the individual they.. inhabit? Control? Not sure what they correct word is. Anyway, at the end of the film we get a glimpse into the heads of various other people (no doubt to illustrate the endless worlds of potential stories and dramas carrying on without us even realising) and they mimic this aforementioned formula. All except for Riley, who has a mix of male and female internal workings. I find that curious. I’m sure it’s just a simple directorial/writing decision to balance the cast from a single gender affair but it could easily be construed as something deeper than that. Maybe I’m reading into it more than I should or just projecting, or remembering that Herman’s Head series again wherein there is a sole female character who represents Herman’s feminine side. I imagine we’ll never know but it’s food for thought. The pairing of Poehler and Smith as the vocal polar opposites is great. Both actors deliver relatable and engaging performances that could have been so easily mishandled in a lesser release. For all intents and purposes it could actually be said that both actresses have been typecast due to their appearances on long-running shows but owing to how much the film benefited from their presence, it’s a fact I’m willing to overlook. Posted on 24th July 2015 27th July 2015 by Matthew Stogdon	This entry was posted in Reviews. Bookmark the permalink.